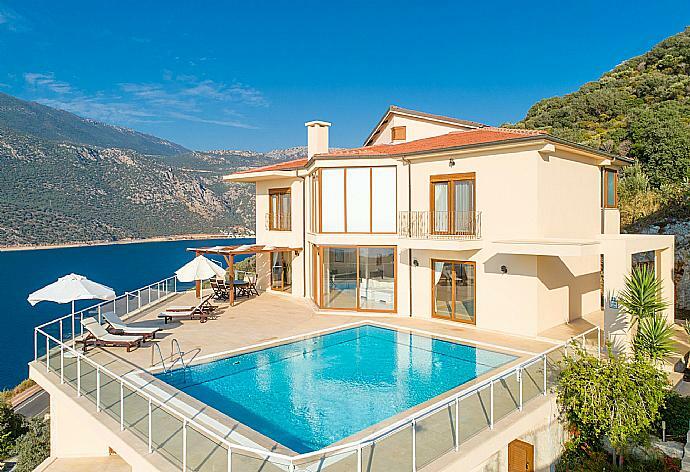 Villa Lara is located in Kas, Turkey. This detached vacation rental property is air-conditioned and sleeps up to 4 people with 2 bedrooms, 2 bathrooms along with private swimming pool and sea views. The villa is walking distance to restaurants. When you arrive at Villa Lara, you will be welcomed by the large terrace, pool and superb sea views. Along with: large open plan kitchen and lounge overlooking pool terrace, second formal lounge with picture window views. Upstairs, 2 bedrooms (1 double and 1 twin) both with large en suite bathrooms. Balconies with sea views.An attractive staircase leads up to an impressive galleried landing off which are two sizeable bedrooms, one double, one twin. Both are en suite and have air conditioning. Villa Lara can sleep up to 4 people. Wonderful villa and easy access to the town. Recommended! Apart from the bed problem, we really loved our holiday at Villa Lara. The location on the Peninsula is fantastic - so convenient for catching the Dolmus into Kas. The villa is very well equipped with everything you could need. The views from the swimming pool terrace are amazing. The pool was a bit chilly but our visit was late in the season - solar heating would be the icing on the cake! 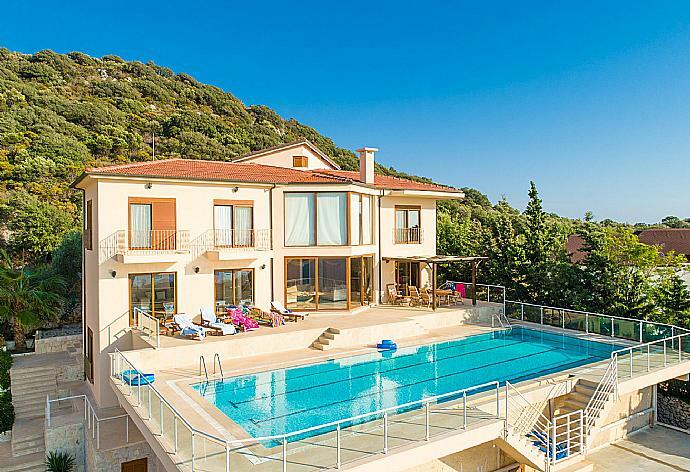 This was our third visit to Kas and Villa Lara didnâ€™t disappoint. We had a late flight on our departure date and we very much appreciated the arrangements made by Agni Travel and the villa owner for us to have use of a room at Hotel Phellos for the day once we left Villa Lara. Perfect stay and really enjoyed Turkey The property was perfect. It was clean and spacious and very much like the photos. Amazing view and location. We were very impressed and hope to book again. Really was a lovely villa, with lovely views. Thanks to the team for dealing with any problems that came up. Really would recommend. Fantastic views, great villa and perfect location to spend a week or two. The four of us (me, my wife and two teenagers) arrived at around 3am in the morning after a 2 hour transfer from Dalaman airport (I can recommend Tunahan Transport for this - Â£70 each way in a very comfortable Mercedes). So straight to bed and then awaking at about 9am in the morning to stunning views across the bay. First impressions in daylight were that the villa actually looks even better in real life than it does in the website photos. The photos make it look a little sparse, but its actually quite cosy but very roomy and bright. When you open up the sliding doors at the front, its like the downstairs is part of the sunny patio - truly living an outdoor life inside. The patio is where we spent most of our time at the villa, by the pool. The pool is quite large for a private villa, large enough to swim laps. The parasols provide ample shade for the pool beds and all are on wheels so can be moved around to suit. Since the website photos were updated, there has been a wooden pergola added above the outdoor dining set, so this is now also completely in the shade. There are steps up to the villa from the driveway, so probably not suitable for the elderly or infirm. The surrounding gardens are landscaped and theres a little vegetable garden at the rear with chilis and tomatoes. The friendly man who cleans the pool (who lives with his wife beneath Villa Susan next door) offered us to pick the chillies if we wanted some. The kitchen area is spacious and has everything you should need, including a large fridge/freezer, dishwasher and gas hob and oven. Theres also a toaster and kettle, as well as a filter coffee maker. When we arrived there was bread, milk and water waiting for us. Theres also a dining table in the kitchen area, but we always ate outside on the patio. At the opposite end of the ground floor is a living area with two sofas and an armchair. Theres a TV here with local satellite channels (essential for us as we were there for Englands world cup games) and a DVD player. In the central area of the ground floor is an L-shaped sofa, which was a great place to sit and admire the view over the water in the evening or early mornings, with the patio doors fully open and a nice breeze blowing through. Upstairs is an open landing with a bedroom on either side. One bedroom had a large double bed, the other two doubles. Both rooms were spacious and airy, and the main bedroom had a double aspect with a lovely breeze blowing through when open. In the main bedroom you can lie in bed looking out onto the sea and the islands in the distance. Both rooms had ample storage and effective air conditioning. Each room has its own bathroom with a large bath and sit down shower. There is a third floor in the villa, where youll find a washing machine and ironing board. In terms of the location, the villa is the first habitation on the Kas peninsula. The peninsula road runs in front of the villa, but the villa is high up and there was little road noise (its not a busy road anyway). Kas town is about 2.3 miles away. We hired a car from Tunahan at Â£12 per day and used this to fetch supplies from the supermarkets. We parked on the dual carriageway at the end of the peninsula and walked the rest of the way as the harbour front was a little hectic and not easy to park at (though there is a car park you can pay for effectively on the harbour wall). There is also a supermarket on the opposite side of the bay, on the marina complex, which is slightly bigger and easier to park at, though we found the prices a little higher than the ones in town as its catering for a captive market - the yachts that come and go. 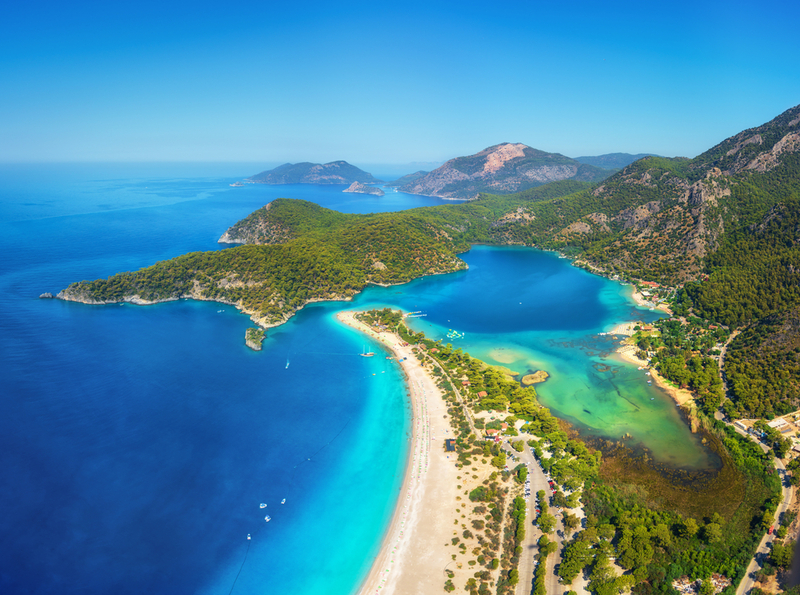 There are three hotels within 5-10 mins walk from the villa (including the Barbarossa and the Mavilim) where you can get breakfast, lunch or dinner or use their seaside bathing areas and diving platforms for the price of a coca-cola or beer. Theres also a restaurant about 10 mins walk away from the villa. In the evenings we caught the local bus (Dolmus) that runs every 30 mins, passing the villa at about 10 past and 40 past the hour. You just flag it down and pay 3 TL (about 50p) each. It runs anti-clockwise around the peninsula and takes you right to the harbour in Kas, opposite Smileys restaurant, which is also where you catch it back. On one occasion a taxi passed us, and dropped someone off at the nearby Barbarossa Hotel. On his way back he pulled over as we were waiting for the Dolmus and offered to take us into town for 15TL. As the bus was 12TL for four of us we went for it, so look out for taxis if you prefer the comfort. The normal price of a taxi is 30TL (about Â£5 - still not bad if you dont want to wait for the bus - we caught the bus into town then the taxi back). Overall we really enjoyed our time at the villa. The views are stunning, especially the sunsets. It was peaceful and easy enough to get into town from. The layout and fixtures and fittings are of a high quality. In all it was a great place to stay. Kas is a bustling town at peak times, but not full of discos and noisy holidaymakers. There are a lot of Turkish holidaymakers here, which makes for a more authentic holiday I think. There are lots of restaurants and bars to choose from for all tastes and budgets. However, even in the higher end restaurants we only paid about 200-300TL for two courses and drinks for four - thats about Â£34-50. Everything is cheap in Kas. The travel agent (Agni Travel) were helpful and informative, keeping in touch proactively leading up to the holiday. Excellent. Beautiful location. Dolmas service to Kas so easy to use. Air conditioning a godsend at night. Hope we will come back to this villa again. We have stayed at the Villa Lara a number of times as guests of friends and were so impressed we took our son and his wife with us this time and it literally took their breathe away, the villa and the view are stunning! Even the pool got good use from all of us, who are not all keen swimmers. The facilities were in good working order and all the amenities were spotless(lovely reception from Mr Hidir, with milk and olives n the fridge and even some bread and coffee in the cupboard. We did have a spot of rain but it made for a change to the brilliant sun and we tested the DVD facilities...all great again and worked a treat for us. We cant wait to plan the next trip and may have to discuss dates with our friend so we all get access. Thanks again Agni travel, super experience. My holiday here with my family was great. In the mornings I would sit with a cup of tea and look at the view--never got tired of it. My kids wont stop asking when were going to be going back! A true Turkish delight! Lovely villa very modern and the pictures don't really do it justice. Pool and villa both well maintenance during our stay. We knew the villa was out of town and not near a supermarket but it was a bit of a pain getting taxis all the time. (Unless you want to hire a car). It was quite windy a few days which kept the temperature down though it did mean we could not use the parasols as one day one blew over. However the villa is very high up so the views are stunning. Could do with a bit more information in the villa on how to use things and few tips on where to eat would be good. All in all a very good holiday and would recommend. Fantastic villa with awesome views. Really quite and peaceful location. Would definitely visit again soon. Villa Lara is a lovely property in a great location with perfect views high over the sea. Very spacious with comfortable room for 4 people with fantastic outside living space. Lovely pool, big enough for a proper swim if thats your thing. Cannot recommend it highly enough! Villa Lara is a stunning brand new villa with the most amazing views. The quality of decor, the tiling throughout the bathrooms and equipment were all first rate, the best we have ever had in a villa holiday. It was immaculately clean and the cleaner visited several times whilst we stayed. We really enjoyed being away from a tourist area, Kas is a lovely little town with good supermarkets and a nice square with restaurants, although we really didnt want to leave the Villa. We used the BBQ regularly. A wonderful break and we will definitely be back. Brilliant, the whole family enjoyed the villa! The villa was truly stunning in a very good location with fantastic views. The Kas peninsula is fairly quiet. The local Dolmos bus runs regularly and makes it very easy to get to town. We tried a number of restaurants and bars around Kas and have no complaints about the food at all. We found the locals to be very friendly and helpful. Again another brilliant stay at the excellent Villa Lara. The services from Agni Travel, the owner, the housekeeper and his wife were first class and we look forward to another visit in the future. Villa Lara is a beautiful villa. The views and sunsets are spectaculareveryday we had the views of swimming turtles below. Cleaner and handyman are very helpful and we were encouraged to pick vegetables from the garden which we used for our lunches and dinners. Kas is beautiful and the quality of food and service in the restaurants is far superior to anything we had previously had in turkey value for money is excellent. Was really sad to leave such a beautiful place waters were warm and crystal clear loved every minute of it. Kas peninsula is stunning location for your holiday will be back for sure. Wonderful holiday, really loved the villa and the location. We had a fantastic stay and would love to stay again. Thank you for this magnificent villa, Lara is a beautiful, very clean and really nice house. We had a fantastic time and are planning to return. This was our first visit to Turkey and I don't think we could have chosen better. Villa Lara was by far the best holiday property we have ever stayed in. I was very pleased with the service from Agni Travel from the booking right through to our return. Kas is a charming resort with plenty of good quality restaurants. Everyone we met was very friendly. Staying on the peninsular was a very relaxing experience because it was so quiet. We hired a car to get us back and from the town in the evenings and to help with bringing back bottles from the supermarket. We managed to find a quiet place to park near the hospital rather than tackle the town. We traveled on the Dolmus a few times - an experience everyone should try at least once during a holiday to Turkey - I never realised so many people could fit on a mini bus. The support from Agni Travel during our stay was fine and on the occasion I sent a question by text I had a prompt response.The handyman pool man was fab, every time he came to the villa he left us with a handful of cucumbers from the owners garden and the pool was cleaned on a regular basis. The cleaner was very thorough and overall the standard of cleanliness both inside and around the pool was exceptional. We will definitely return to Kas in the future and hopefully to Villa Lara. Lovely spacious villa in great location with fantastic 180 degree views. Loved Kas which had a very Turkish feel rather than a typical tourist destination. Would definitely come back again and would rent villa Lara. We had a fabulous holiday in this superb villa. The views were amazing and the services from housekeeper and cleaner and local agent Suleyman were excellent. Excellent Villa, excellent location and views were fantastic. The villa was lovely and the cleaner excellent with three changes of towels etc during the week. We were also very pleased to be given the Wifi password by the owner next door which was an unexpected bonus. The property was excellent and in fact exceeded our high expectations in every way. The cleaner and caretaker were friendly and efficient - nothing was too much trouble they took great care of us without intruding on our privacy. This is our 4th visit to the Peninsular and by far the best accommodation we have stayed in. Customer service from Agni travel is also excellent. I like the timely and reassuring text messages. Thank you - I cant imagine using any other company from now on. Overall a terrific villa with spectacular views. 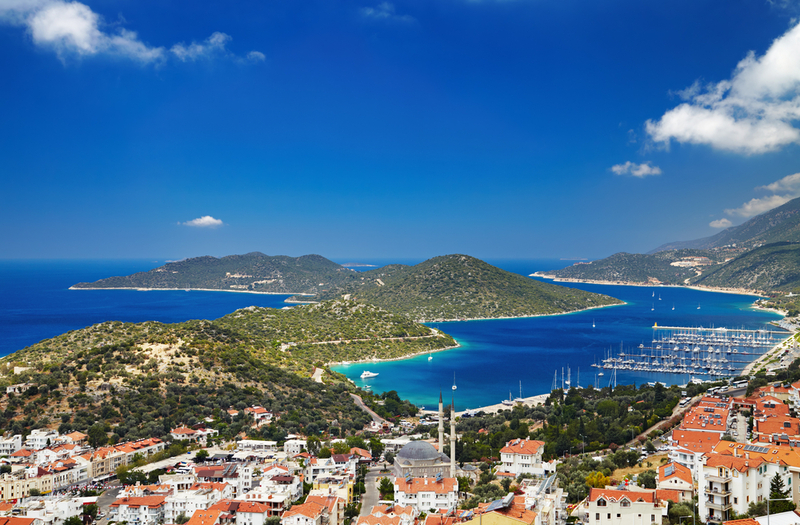 Ideal location to enjoy Kas and the surrounding area. Einfach traumhaft Wir kommen wieder Danke an alle fr die schne Zeit in einem tollen Haus. Villa Lara was a delightful place to stay. The position could not be beaten for wonderful views and sunsets and the feeling of space in the villa was lovely. We have very happy memories and would hope to book the villa again.Thank you. Kas is an unspoiled fishing village which has lost none of its charm. Dotted with ruins of the ancient Greek town of Antiphellos, among the more recent Turkish buildings to create a unique atmosphere. Just opposite Kas, across the water, lies the Greek island of Megisti (Kastellorizo) with daily boat trips to visit or you can rent your own Gullet and visit different beaches and bays on the way.